Your guide to the hottest pieces from the best local shops. Seattle is a hub of design and innovation, and that creativity also applies to the spaces we call home. From unique materials to imaginative forms, our city’s interior design shops have no shortage of distinctive decor to transform the rooms we inhabit. Taking a cue from our four favorite design trends (including the enduring Northwest celebration of the outdoors), this year’s guide to local shops is sure to inspire you to create the abode of your dreams. It’s time to get back to nature. The latest home decor trend takes inspiration from a Northwest design principle of bringing the outside in with rugged yet refined materials and gorgeous green tones. 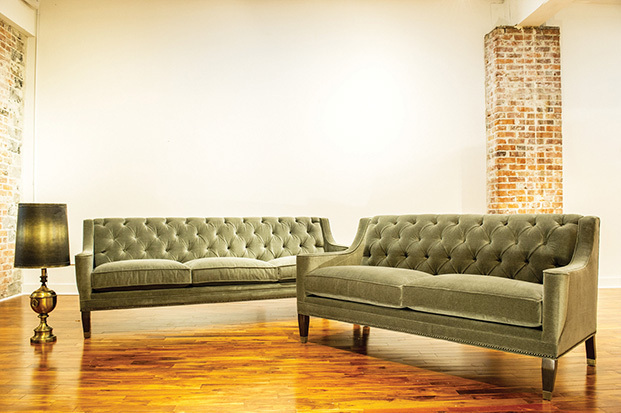 Picture Above: Upholstered in a touchable, trendy crushed velvet, this supple sofa from Couch (Ballard, 5423 Ballard Ave. NW; 206.633.6108)—built to order just like all the other super-comfy, chic creations at Ameer Radwan’s inviting Ballard shop (custom upholstered sofas, $1,600–$3,500)—has us green with envy. 1. Elevate your home’s objets d’art with these “Bird on a Rock” sculptures ($160 each) by Seattle-based artist Shelli Markee at Click! Design That Fits (West Seattle, 4540 California Ave. SW; 206.328.9252), which has a history of curating standout local artists. These delicately designed birds in flight (complete with steel wire signature) are no exception. 2. For your next dinner party, offer up a spread on this David Price cheese board ($75), which looks less like kitchenware and more like a work of art. Made from salvaged board and nails from the Oregon woods and cast in white porcelain, its artisan quality is right at home in the Butter Home shop (Melrose Market, Capitol Hill, 1531 Melrose Ave., C2; 206.623.2626). 3. Crafted from solid teak in a natural oil finish, this rustic MASHstudios PCHseries dresser ($2,700)—which is right at home in midcentury modern mecca Digs (Ballard, 2002 NW Market St.; 206.457.5709)—is refined by a cast aluminum drawer front that mimics the piece’s subtle woodgrain look. 4. The perfect marriage of modern design and raw materials, the rosewood-topped “Sono” metal base coffee table ($995) epitomizes the organic aesthetic of Tirto Furniture (Capitol Hill, 1908 E Mercer St.; 206.322.0597). Pieces vary slightly based on the nature of the material, making your selection one of a kind. 5. Take a seat on Room & Board’s (University Village, 2675 NE University Village St.; 206.336.4676) bubble-shaped reclaimed wood stool ($349). Made from salvaged Douglas fir barn parts, this versatile item is representative of R&B’s dedication to sustainability. No need for a stool? This piece can work as an end table or night stand to give a natural touch. Defined by mod, angular furniture and sleek, graphic accessories, this trend works all the angles. 6. Bold and stylistic, the Genevieve Gorder collection for Tempaper is perfect for those who like the idea of wallpaper, but not the permanency of it. The “Intersections” style in shiny metallic bronze ($125/roll) sticks on and peels right back off almost any wall. This, and a wide array of other wallpapers (plus beautiful plush bedding from the owner’s own line), is found at cute little Adorn (Phinney Ridge, 7003 Third Ave. NW; 206.449.6220). 7. Inspired by the early-20th-century Russian modernist Kazimir Malevich—and designed by Seattle-based design company Ladies & Gentlemen Studio as part of a special collection for Roll & Hill—the “Kazimir” wall sconce ($2,200) is as luxe as the rest of the modern merchandise at Inform Interiors (South Lake Union, 300 Dexter Ave. N; 206.622.1608). 8. Shape up snack time with these stackable “Hive” cups ($14/each) by D. Patterson Design Studios, from Click! Design That Fits. These multipurpose cups reflect Click’s modern philosophy and can also be used to serve coffee or tea, or even to hold candles and desk items. 9. Stash your stuff in style in the “Galena” cabinet ($4,729) by Miniforms, from chic contemporary home shop Alchemy Collections (Belltown, 2029 Second Ave.; 206.448.3309). Set in a solid oak frame, this asymmetrical set of drawers functions the usual way, but with more visual impact. 10. Your living area will be looking sharp with this walnut veneer cocktail table ($499), found exclusively at Kasala (two locations, including Pike Place Market, 1505 Western Ave., Suite 400; 206.623.7795). Outfitted with a brushed stainless steel base, storage drawer and a clever lift mechanism so that the top can be raised, this beautifully shaped piece is indicative of the stalwart boutique’s sophisticated, swank aesthetic. Like all the handpicked pieces sold at Ruth True’s eclectic-cool apparel and home shop Nube Green (Capitol Hill, 1527 10th Ave.; 206.402.4515), this slick chair ($4,500) is proudly made in the U.S.A. Created by Seattle duo Tamara Codor and Sterling Voss, the angular design features repurposed materials, an antiqued brass finish and finely etched dovetail details. Featuring playful palettes and innovative designs, these pieces are both tongue-in-cheek and totally chic. Are you digital or analog? With RH The Gallery at University Village’s (University Village, 4645 26th Ave. NE; 206.522.2775) “Vintage Trunk” digital conversion turntable ($249), you can be both! Nestled inside a vintage-style suitcase, this music player highlights what RH does so well: combine classic charm with current style. Pop on your favorite vinyl with the option to record digital files while you keep the beat going. Wipe off mud-speckled soles with a bit of whimsy: Crafted from oiled beechwood and bassine fiber bristle, the Bürstenhaus Redecker hedgehog doorstop and shoe cleaner ($55.25) is just one of the modern marvels from downtown’s Design Within Reach (Pike Place Market, 1918 First Ave.; 206.443.9900). Jonathan Adler’s (University Village, 2650 NE University Village St.; 206.525.0930) quirky decor adds a sense of fun to any room. A modern take on your grandmother’s needlepoint, the hand-embroidered “Mod Model” throw pillow with velvet back ($165) adds a bold pop to your chair or sofa. A new slant on shelf storage, Alchemy Collections’ statement products include the whimsical “Primo Quarto” bookcase ($3,399/short, $4,259/tall) by Italian brand Saba Italia. Sloped and curved, this unit displays your library or art collection with extra panache. Euro-chic accessories and creative lighting, like this 4-foot-long beauty. Checking the time was never so stylish: A true statement piece, Studio Job’s “Altdeutsche” solid pine grandfather clock ($5,305), from Diva Furniture/B&B Italia Seattle (downtown, 1300 Western Ave.; 206.287.9992)—our go-to for modern, Italian-designed furniture—features playful hand-painted artwork as well as an eight-day movement. Each model comes with its own custom winding key. Lavish your home with a legendary staple by including this reissue of iconic designer Adrian Pearsall’s “Curve Fabric Wave Sectional” ($3,395–$5,795). With a maple sleigh base inset and shown here in “Fog” Vintage Velvet fabric, each section can stand alone or be combined to create customized shapes, exemplifying RH The Gallery at University Village’s luxurious simplicity. It’s like floating on a cloud in your own living room. Dine in with Madisonware Ceramics’ original stoneware and porcelain dishes ($24–$160) decorated in softened hues by maker Tracy Madison, who crafts each item in her West Seattle studio. New home shop Bayle & Co. (Seward Park, 5224 Wilson Ave. S; 206.676.2624), owned by designer Michele Bayle (who brought her magic touch to The Starlight Room in Port Townsend), carries Madison’s signature pieces as well as other curated products by local craftspeople—be sure to pop in! Relax and sit a spell on the “Quinn” chair ($999), a cozy favorite among Room & Board’s timeless furniture collections. Available in an array of styles, we drift toward the Phalen “Ocean” fabric (special order in-store) and its moody Pacific Northwest palette. From the sophisticated Henredon Schoener (Bellevue, Lincoln Square, 700 Bellevue Way NE; 425.454.9000), the Kelly Wearstler “Crescent” nightstand ($6,885) is accented with pyrite pulls, cast brass legs and a parchment-wrapped walnut exterior—sure to add a subtle elegance to your boudoir. Set on crystal clear bases, these petrified wood bookends ($272) from Pulp Home (206.701.9795)—a chic online boutique curated by designers Beth Dotolo and Carolina Gentry as an extension of their Ballard- and Dallas-based interior design firm—are sure to add luxurious appeal to your library.